The Barnetts Couriers truck division is up for sale. Expressions of interest have been called for the purchase of the 40 trucks and three prime movers of the Wollongong-based Line Haul Pty Ltd business. 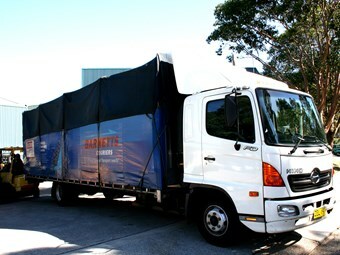 Barnetts Couriers, which was established more than 50 years ago, is based in Wollongong. Line Haul states that it has a "strong and consistent" cash flow under contract to Bennetts. It operates throughout NSW, Victoria and Queensland and can be managed on either a dry-hire basis utilising existing franchisees or with employees, it adds. According to the Barnetts website, most drivers are contractors, with numbers put at 200. The company prides itself on an in-vehicle computerised network and a laser image reading computer which allows jobs to be booked online and tracks fright. It also allows access to the last six months of freight movements. The fleet consists of Hino and Isuzu five-tonne courier trucks, including purpose-built tray tops, and Hino prime movers with Tautliner trailers.